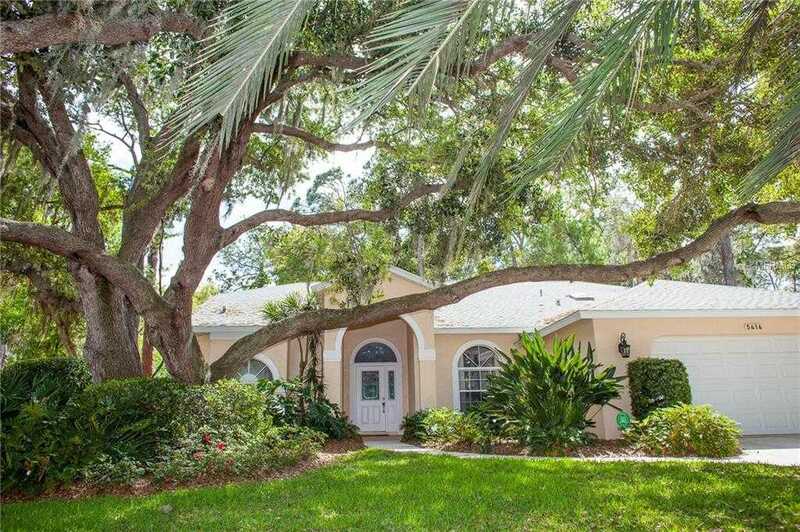 Majestic oaks surround this split plan, 3 bed, 2 bath home that beckons you to retreat outdoors to the screened in, tile floored lanai with your morning coffee. The meticulously landscaped backyard borders the hidden gem, Conservatory Park, which has extensive walking trails, and a stunning lake for your recreation and enjoyment. Natural light pours in through multiple french doors that lead to the lanai, 3 expansive hurricane impact skylights and new back windows framed with plantation shutters that showcase your lush backyard even from your kitchen sink. The centrally located eat in kitchen is the hub of the home complete with an island, a new wall oven and stovetop overlooking your lanai and living room fireplace all detailed with crown molding. The stand out master suite with vaulted trey ceilings has a perfect space for a tranquil reading nook, a large mirrored master bath outfitted with a jetted tub, quartz countertops, and 2 walk in closets. The oversized 2 car garage is equipped with a newer hurricane impact garage door and opener, new water heater, as well as hurricane protection for the entire home for peace of mind and savings on your homeowners insurance. Palm Aire Country Club is within biking distance and offers optional memberships both golf and social. With this house being conveniently located to University Parkway 8217;s UTC shopping and restaurants, Sarasota airport, and beaches what an opportunity to find that this property has NO HOA or deed restrictions. Please, send me more information on this property: MLS# A4430963 – $345,000 – 5416 Palm Aire Dr, Sarasota, FL 34243.